Star Ocean: Integrity and Faithlessness is my first Star Ocean game. And if this one is par for the course, I’m not too interested in playing another. I love fantasy JRPGs. I love sci-fi stories. So I assumed Star Ocean, as a mixture of both, would be a great fit for me. And, truthfully, if it were just up to the plot alone, I’d be happy enough. Star Ocean: Integrity and Faithlessness is the story of Fidel, a young swordsman living in a port town far from his kingdom’s capitol. After barely repelling an attack by raiders, he and his childhood friend Miki head to the capitol to request aid. On their way home from this mission, the two fantasy-world inhabitants come upon a crashed spaceship with a little girl, Relia, inside. Using a strange power, Relia freezes time and the three escape. From there, the story becomes one driven by the mystery of Relia’s powers. Fidel and Miki, eager to help the child, travel with her across the kingdom seeking insight. Along the way they meet a noble knight, a magic researcher, and two mysterious travelers that don’t quite fit in. Pursued through a kingdom at war by enemies that have weapons unlike anything Fidel’s world has seen before, the team struggles to defend Relia and the power she possesses. Overall the story is a good 25-hour-long mix of fantasy and sci-fi. The odd thing is the way in which the story is told: There are few traditional cutscenes in Star Ocean: Integrity and Faithlessness. Instead, whenever you reach points where a cutscene would normally be, your characters slow to a walk and the conversation begins. Instead of the dynamic camera angles and close ups you would expect in most modern RPGs, your camera remains the same as normal, requiring some clever manual camera work if you want to see the characters’ faces in detail as they talk. This is a problem because facial emotions can deliver much more impact than a voice alone. Compounding this problem is that you are still able to move when conversations take place but are trapped within a glowing red barrier that marks the limits of the scene. I found that trying to glitch the camera to see better and the magical red line broke my immersion in the game more often than not. Another issue I had with the conversation scenes is that they are unskippable, unlike the rare traditional cutscenes in the game. For most of the game, this wasn’t a problem as I never had to watch one more than once. Then I ran headlong into the game’s most annoying feature: protect-the-target boss battles. But before we get into that, let’s take a step back and talk about the combat system in general. 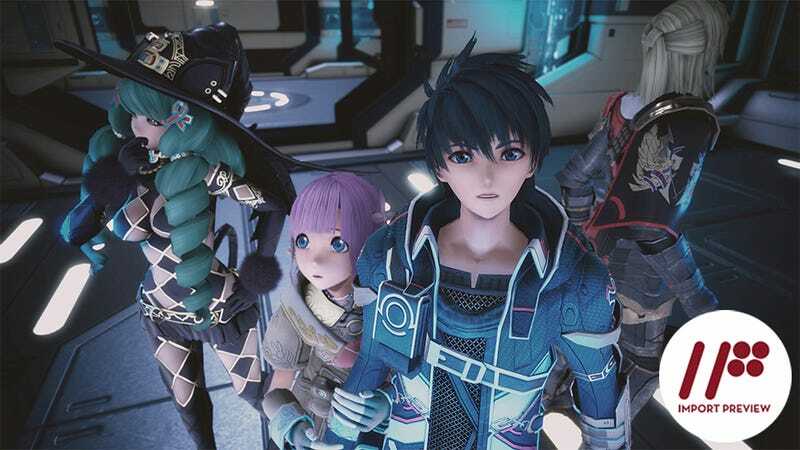 On its most basic level, Star Ocean: Integrity and Faithlessness plays like any of the recent games in the Tales series. At any time, you control one character, move him or her about in real time, and attack with a mix of normal attacks and techniques/spells. The rest of the characters are controlled by the game’s lackluster AI. AI customization in Star Ocean: Integrity and Faithlessness comes in the form of roles. These are stat-boosting or skill-adding customizations. For example, some of these add bonuses when a character blocks while others give bonus damage to a specific type of enemy. One fantastic role limits casting time of spells by up to 50%. Four at once can be equipped to each of the seven party members. While the roles are vital to playing the game, they are far from simple AI commands. There were none I ever came across that would, say, command a healer to stay at max range from a boss at all times or run away when being attacked instead of just standing there, being interrupted. Likewise, there wasn’t a command that would command a mage/healer to manage her threat and not over-damage/over-heal. Because of this, the further I got into the game, the more it reminded me of playing with a newbie-filled pick-up group in World of Warcraft without a mic. The tank doesn’t know how to position enemies and the DPS/healer don’t understand how to manage threat. And most annoyingly, I am unable to tell them how to play better.The best I could do to counter this was to spend most of the game as either the mage or healer characters. And this worked well enough until I reached the mid-to-late game string of “protect the target” missions. These missions were the worst. To start, the enemies would bum-rush the target character, attacking all at once. More often than not, this would kill the target in seconds, causing an instant game over. The third of these battles was preceded by a 57-second, unskippable cutscene. I must have seen it a dozen times as I tried out various role combinations and upgrades in futile attempts to win. The fourth of these protect-the-target battles wasn’t quite as bad because there was a doorway choke point in between the target and the spawning enemies. However, immediately after it was an incredibly hard boss fight with no saving allowed in between. Another boss battle shortly after had no save point between it and the next boss battle, but it did have several minutes of unskippable talking scenes. In all honestly, had I not been playing the game for work, I would have quit at any of these points. Frustrating doesn’t even begin to explain it. Perhaps all would be forgiven if I could have switched to easy difficulty, but the game doesn’t allow a change in difficulty without restarting the game from the beginning. Visually, Star Ocean: Integrity and Faithlessness is a mix of the beautiful and cheap-looking. The character models are excellently designed and detailed, but the faces look flat and generic. The effects in battle are flashy and cool-looking but constantly clip through walls. But perhaps the oddest quirk in the game visually is its space battles. There are several major space battles over the course of the game, though not like you’d expect to see. These battle scenes take place entirely on the bridge of your ship, which closes its windows before battle. You never see the space battle from an objective viewpoint. In fact, it’s not until after two of these battles that you even see an enemy ship, or the outside of your own. To put it another way, space battles are what would happen if you took a space battle from Star Trek, removed all footage of the ship models fighting and blanked out the view screen. All that’s left is people shouting commands and vector numbers. A tense battle scene does not this make. Star Ocean: Integrity and Faithlessness is a game I feel I would have enjoyed much more if I had just played it on easy and been able to experience the story to its fullest. The AI is flawed, the graphics an odd mix of beautiful and cheap-looking, and the protect-the-target missions are just the worst. Those invested in the series may still find plenty to enjoy here, but for me, my lasting impression of the game will forever be a negative one. Star Ocean: Integrity and Faithlessness was released in Japan for the PS4 on March 31, 2016. It is scheduled for a US release on June 28, 2016 and in Europe on July 1, 2016.